Iran is a black swan for sending oil prices higher. Iran has been both defensive and hostile of late. And perhaps the theocratic despots in charge have some reason for concern. 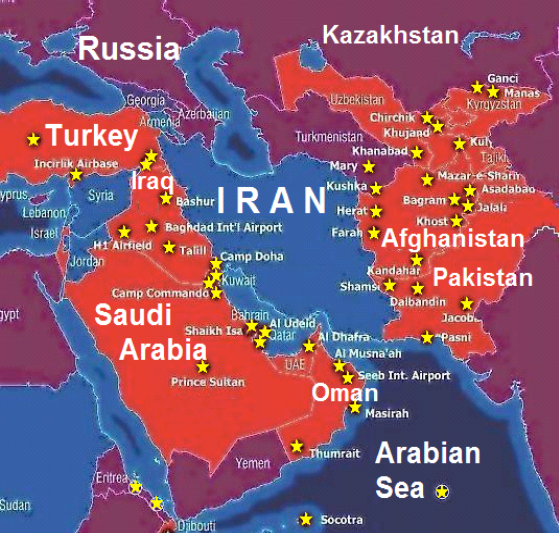 Below, you will find a map indicating that Iran is surrounded. Each star is a U.S. military base. UN Security Council Resolution 2231 calls on Iran "not to undertake any activity related to ballistic missiles designed to be capable of delivering nuclear weapons, including launches using such ballistic missile technology." There have been a number of incidents, including fast boat harassment in the Strait of Hormuz on Sunday. The U.S. Navy destroyer, USS Mahan, fired warning shots. According to the Wall Street Journal, this was just one of seven incidents over the weekend. In Yemen, Iran surrogates fired missiles at Saudi Arabian ships over the weekend. A defense minister also said they could destroy Tel Aviv in seven minutes. The list of hostile events is long, goes back decades, and includes drones flying over U.S. vessels and the capture of U.S. sailors. On Friday, Trump imposed sanctions against 25 individuals and entities involved in Iran’s missile program. These did not conflict with the nuclear deal. No one doubts that Iran is a real and growing threat. But there are two sides to the country. One is the militant clerics left over from the 1979 revolution. On the flip side is the young, educated population that grew up in a theocracy they don’t like and shut down the country a few years ago in protest marches. There are also the businessmen. Recently, Iran signed a $16.6 billion deal for 80 Boeing passenger jets as well as another deal with Airbus. Bidding for oil production contracts starts on February 15, with Total SA and BP PLC taking the lead. 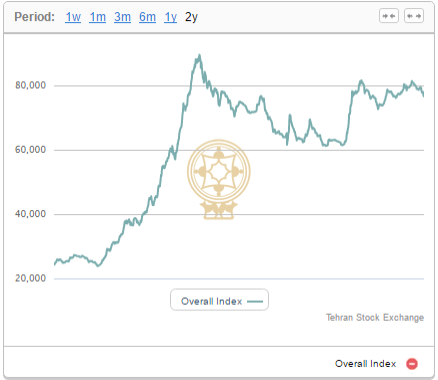 Iran’s stock market, which is still one of, if not the, most undervalued markets in the world, was up 320% over the past two years. Though lately it has come under selling pressure due to renewed saber rattling. There is no evidence of an imminent attack on or by Iran, but with tensions high, things can happen. Iran has threatened that it could close the Straits of Hormuz, where 40% of the world’s oil flows in tankers. Kuwait, which is heavily armed by the U.S. and is home to American bases, is located on the southwestern border of Iran. The last oil price shock in the Middle East was in 1990, when the United States invaded Iraq in response to Iraq invading Kuwait. The price per barrel of oil went from $21 to $28 on August 6... to $46 by mid-October. A war with Iran is not priced in. The country claims it will be producing 4 million barrels a day by the end of March, and furthermore, Iran is exempt from the OPEC production cuts. Iran has the fourth-most abundant proven oil reserves in the world and ranks fifth in terms of production. If any action prevents the flow of Iranian oil, the price of crude will clear $100 a barrel almost overnight. Energy and Capital editor Keith Kohl breaks down the production cut agreement made by OPEC and questions whether it's really as bullish as it sounds. 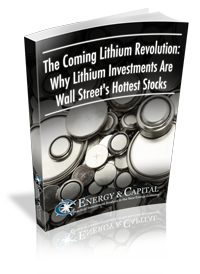 Energy and Capital editor Christian DeHaemer talks about the Fed, rate hikes, inflation, and the upward movement of the Dow Industrials.